Summer and fall are the perfect times to visit Long Island; pack up the family for an epic road trip, soak up the sun at the beach, and simply enjoy a week or two of relaxation away from home. Especially in the warmer weather, you may be tempted to take your furry friend along for the ride! You can feel confident bringing your pet along for the trip knowing we offer an on-site pet hotel and daycare in case certain outings are not pet-friendly. If you plan on taking a trip to Long Island with your pet, keep in mind the following safety tips to ensure a fun, safe journey. If your pet isn’t used to car rides, take him or her on a few short rides to help prepare for the trip. Be sure to bring treats along and reward proper car manners! Bring along a travel kit that includes your pet’s favorite food, a familiar toy, bowls, leash, plastic doggy bags, any medication that your pet is taking, first aid essentials, vaccination history, and plenty of treats! Stick to a light meal before the trip to avoid any upset tummies. Be sure to know where the nearest 24/7 emergency veterinary hospital to your destination is located. East End Veterinary Center is the only hospital in Eastern Suffolk County that provides emergency care around the clock. 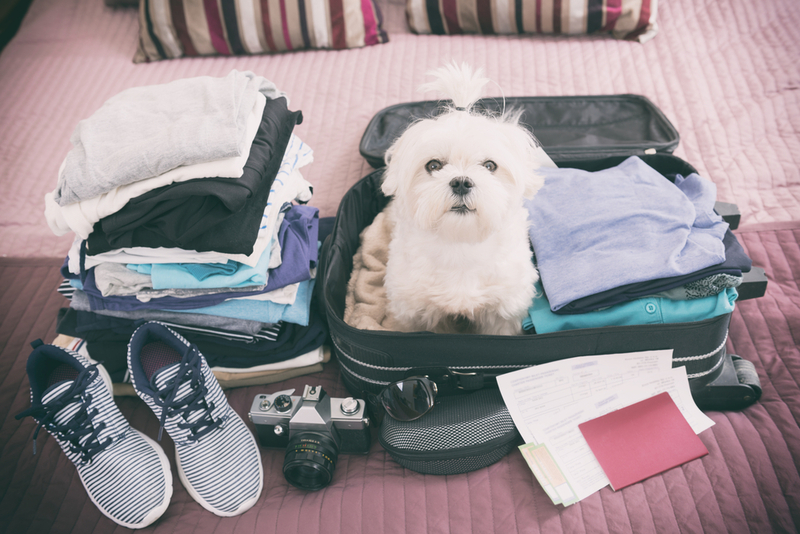 Contact your family veterinarian prior to any travel with your pet to ensure that he or she is healthy enough for the journey. Never leave your pet in the car on a hot summer or fall day. A car acts as an oven and temperatures can rise to dangerous levels in minutes, even with the windows cracked or when parked in the shade. If you need to stop for some snacks, be sure that someone stays with your pet in the car while it’s running, or you can find a convenient drive through! Beaches: The area offers plenty of sand and surf, including the famous Jones Beach State Park, a popular destination since the 1920s. With so many miles of shoreline, you’ll find a variety of water activities, such as surfing, scuba diving, whale watching, and exploring historic lighthouses. Montauk Point State Park, another popular beach area, boasts its famous lighthouse as well as surfing and seal watching. Before heading out, check to see whether the beach you are going to is pet-friendly. While some beaches allow dogs under certain circumstances, others don’t allow them at all. Historic sites: Take a guided tour of Sagamore Hill, a 23-room Victorian mansion that was home to Theodore Roosevelt from 1885 to 1919. You can also tour the birthplace of Walt Whitman, which has been preserved to look as it did when the famous poet lived there. Museums: Check out the Sag Harbor Whaling Museum, Nassau County Museum of Art, or the Vanderbilt Museum and Planetarium. For people with children, the Long Island Children’s Museum offers hands-on activities that will keep children entertained for hours. Each of these museums offers a unique experience, some of which can only be found on Long Island. Outdoor activities: The area has plenty of opportunities for camping, hiking, golfing, bird watching, and more. Aside from the beaches, the area is home to a number of farms and orchards that can be explored. Depending on the season, you can go strawberry, apple, peach and pumpkin picking, and you can bring home some of the best produce that Long Island has to offer. Shopping: Whether you prefer a large outlet mall or a small antique store, you can find it here. The Tanger Outlets are a great place to shop, and some of the stores even allow you to bring in your four-legged friends. There are several other stores in the area that will allow pets, too. Be sure to call ahead to see if the places you wish to visit are pet-friendly or not. Dining: The Northeast is a hub for great food. Whether you want fresh seafood or a Sicilian-style pizza, Long Island has you covered. From formal to trendy, you can find food of all kinds in the area that you’ll rave about until you can make it back for another trip. While there is a lot to do on Long Island, you may not be able to bring your cat or dog everywhere you go, or your pet may need a break from the all the exciting things you have planned. If you’re looking for a pet hotel or daycare in the Long Island area, ask to take a tour of Chateau Des Paws, East End Veterinary Center’s award-winning pet boarding and daycare facility in Riverhead, NY. Your pet will enjoy the spacious suites, custom-made bedding, and plenty of room for playtime. You’ll like the fact that Chateau Des Paws is conveniently located within the animal hospital, and always close by veterinarians and trained medical staff. Should a medical issue ever arise during his or her stay, he or she can be transferred seamlessly for care. The boarding facility has space for both cats and dogs, and you can have your pet groomed at the facility as well. Chateau Des Paws won the Best of the Best Dan’s Choice Awards in the pet boarding category in 2015 and 2016. To schedule a tour or to learn more about Chateau Des Paws, call (631) 591-0412. East End Veterinary Center is your specialty and 24/7 emergency vet center for companion animals in Riverhead, NY. Appointments are not required to see a veterinarian in an emergency; however, you are encouraged to call ahead at (613) 369-4513 so our veterinarians can prepare for your arrival.